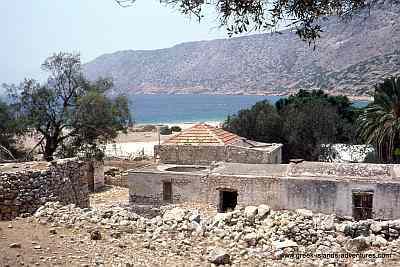 Alimnia is an abandoned island in the Dodecanese group, an easy boat trip from Halki. 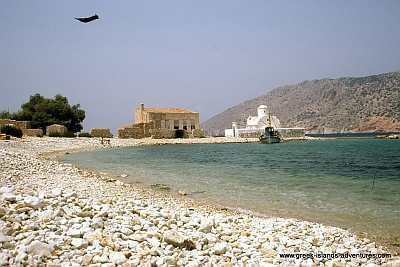 Whilst we were on holiday in Halki we spent most of the time on the beach. However after a while we thought that there must be more to life than reading and swimming. The local Laskarina rep organised a weekly beach party/picnic trip to the island, so off we went. They arranged all the transport and food, all we had to do was turn up. About 20 of us all got on to a ferry and were left marooned on the island to have our picnic. It was quite strange wandering around the abandoned village, there were odd bits of furniture scattered about. 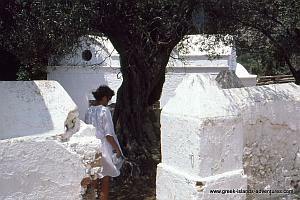 The church itself was kept in good repair and is still used on various feast and saint days. 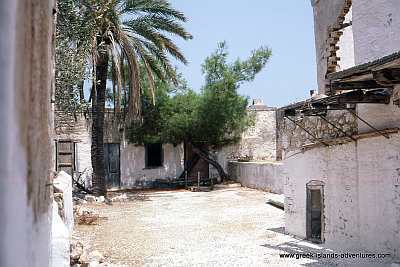 During World War II the island was used as a submarine base, initially by the Italians and then the Germans. At the time of our visit it was still possible to come across old artifacts from the war. We found an old helmet, possibly German. Although we left it as we found it, I don't suppose it stayed for much longer. We enjoyed our picnic so much that we went again a week later. Well.. there wasn't a great deal else to do on Halki. The second time was particularly exciting even though we had been before. Why was that you ask? Have you ever watched the film 'Picnic at Hanging Rock' ? (Yes I know it was located in the Australian Outback, several hundreds of miles from the sea). Anyway the main plot was about a group of school girls who went for a picnic to a sacred Aboriginal rocky outcrop and slowly, mysteriously disappeared one by one. What has that got to do with a beach party on a Greek Island? The village already had a mysterious aura about it and this became more and more tangible as the sun began to set and our expected ferry back to Halki did not appear. We were all sitting around on the beach sort of looking over our shoulders all the time to make sure nobody had gone. Incidently that is dirt on the lens not a UFO! Alimnia is definitely worth going to, especially on an organised beach party like we did. 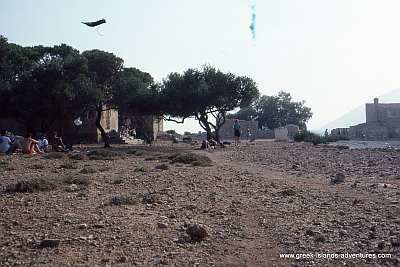 It gives you a break from the strenuous activities on Halki; swimming, sunbathing, eating, sleeping. You know the kind of thing. Incidentally for anyone that does not know, Hanging Rock does exist, we have been there and it really does have a strange feel about it. We wouldn't want to stay there in the dark! What do you know about Alimnia? 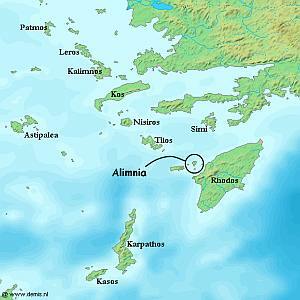 Have you been to Alimnia and been fascinated by its mystery? Or maybe you have some interesting information about its history or people that have lived and worked there? I would love to read about it and be able to pass it on to others who visit this website. You can add a picture or two, that always helps to bring stories to life. (Multiple images will be clickable thumbnails to give the bigger picture. Do you have some pictures which go with your Alimnia story? Great! Click the button and find the first one on your computer. Select it and click on the button to choose it. Click here to edit your Alimnia story.